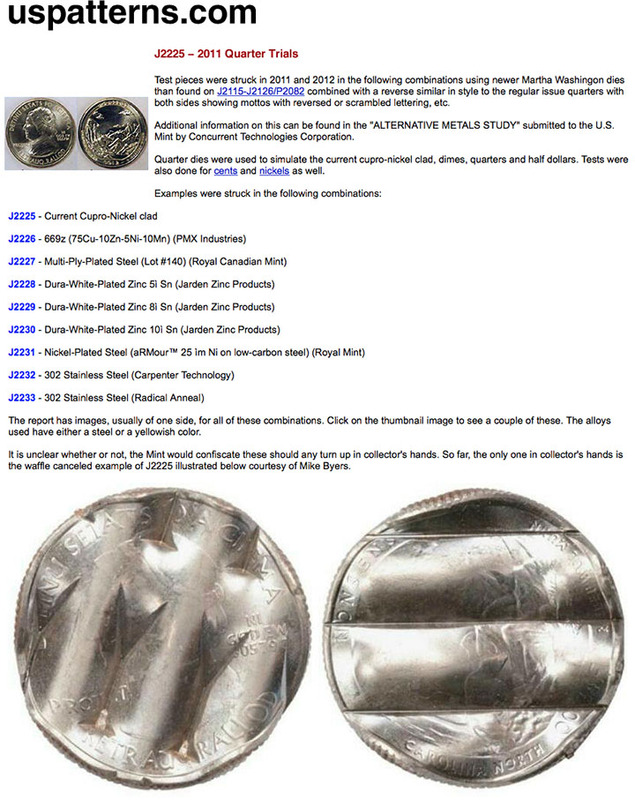 Photo courtesy of uspatterns.com and the U.S. Mint. There are no known pieces in private hands. 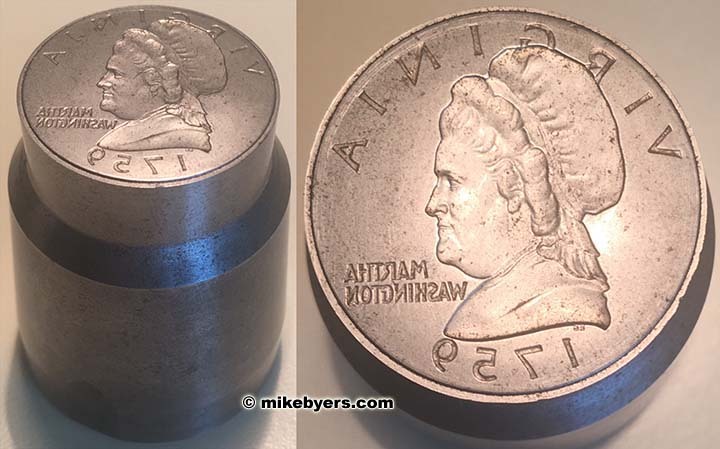 Newly redesigned Martha Washington dies were used to strike test pieces at the United States Mint in 2011 and 2012. This unique discovery 2012 Quarter struck with these new Martha Washington "nonsense" designs has been assigned Judd #2225 and is listed on the U.S. Patterns website (uspatterns.com). Martha Washington quarter-size dies were used to test the current cupro-nickel clad dimes, quarters and half dollars. 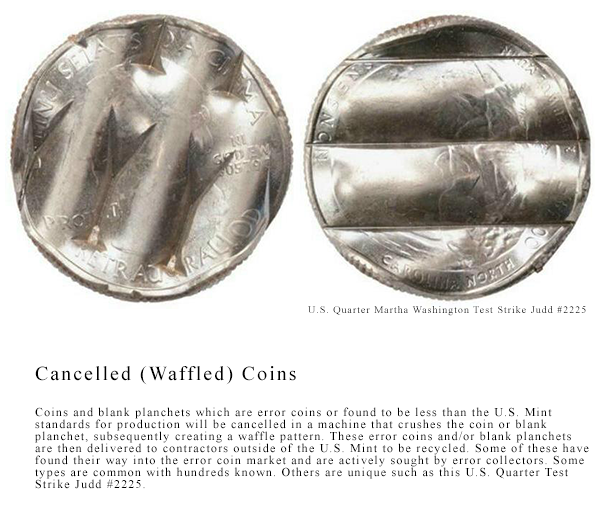 Test strikes were struck on cents and nickels as well. As noted on the U.S. Patterns website, the quarter design using the new Martha Washington dies was tested in 9 metals. The design on this Mint Cancelled J-2225 uses "nonsense" designs. The obverse depicts a different design of Martha Washington along with nonsense lettering and has an identification number 00534F in the 5 o'clock position. The reverse depicts a mountain with a rhinoceros along with nonsense lettering and also has an identification number 30579 in the 3 o'clock position. 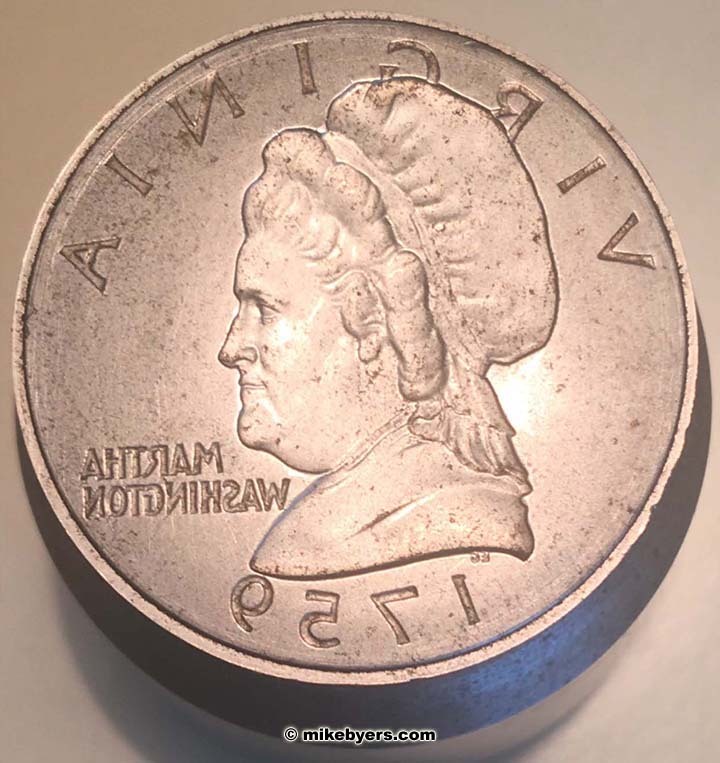 The only other known Mint Cancelled test piece using these newly designed Martha Washington dies is a Jefferson nickel struck on copper-plated zinc alloy. 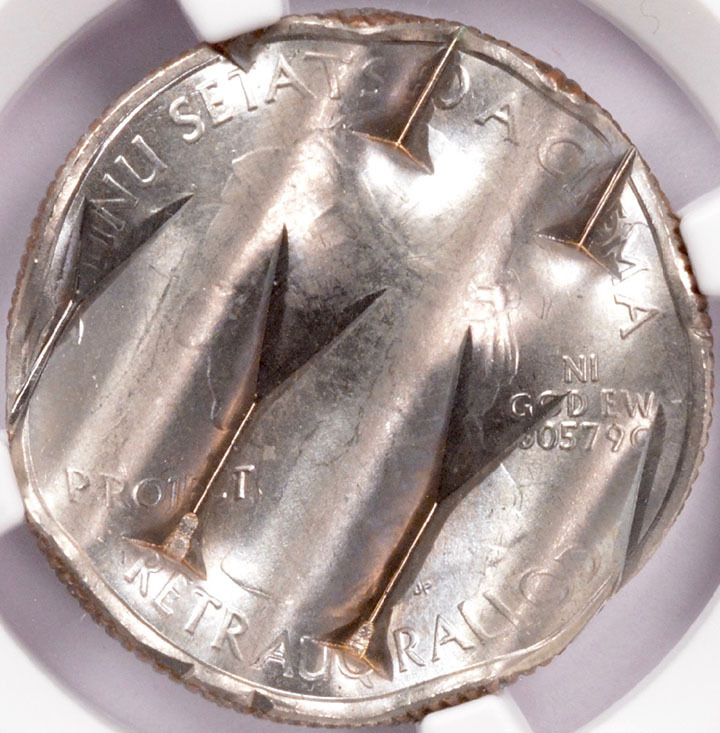 Both of these unique test strikes were produced during the U.S. Mint's 2011 and 2012 testing under the provisions of the Coin Modernization Oversight and Continuity Act of 2010. "The Mint constructed a dedicated R&D laboratory within the Mint at Philadelphia and conducted two series of test strikes and evaluations on 29 different formulations. The evaluations consisted of tests for hardness, ductility, weight, color, surface finish, coinability (ability to be struck into a coin), corrosion and wear resistance, electro-magnetic signature, supply chain availability, and cost." "A second round of coins was struck at the United States Mint in late March 2012. These nonsense pieces were tested by three manufacturers: two coin-acceptor and one coin-handling equipment manufacturers." 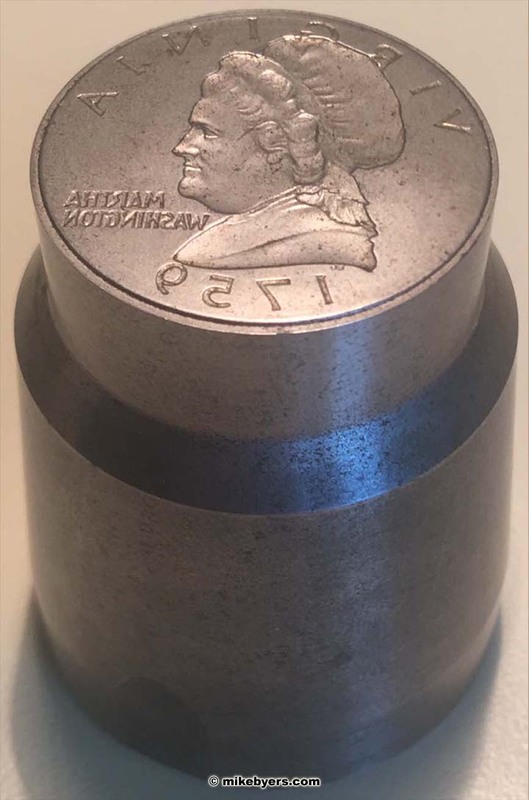 The U.S. Mint drastically changed their procedures regarding the testing, striking and production of test pieces using the newly redesigned Martha Washington dies. 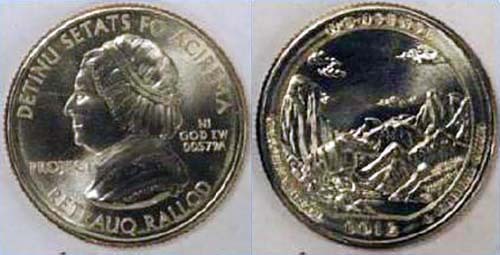 Originally, when the first design of the Martha Washington dies was used to test the SBA Dollars in 1999, the State Quarters in 1999 and the Sacagawea Dollars in 2000, the Martha Washington dies were sent to three manufacturers, IDX Inc., Olin Brass and PMX Industries, who used the dies to strike Martha Washington test pieces. These three companies were experimenting with different compositions of U.S. coins for the SBA Dollar, State Quarter and Sacagawea Dollar. 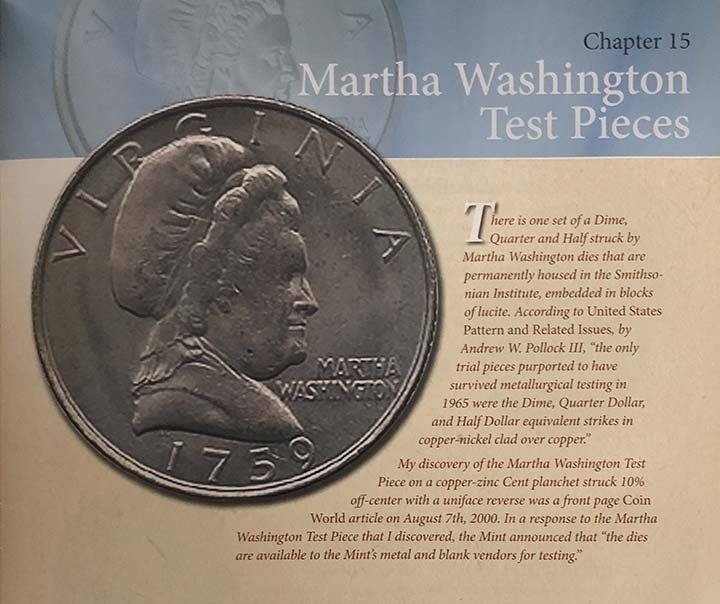 In 2011, as documented in the official report, the U.S. Mint constructed their own research and development laboratory inside the Philadelphia Mint to test coins using the newly redesigned Martha Washington dies. 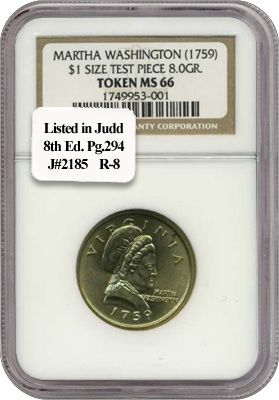 This change in procedure is obviously the reason why after 7 years of striking the newly redesigned Martha Washington test pieces, there has only been one unique Martha Washington nickel test piece on a copper-plated zinc alloy and this unique 2012 clad quarter Martha Washington test piece, Judd #2225. This is in stark contrast to the situation in 2000, when I discovered many different Martha Washington test pieces in different denominations and on different compositions. To date, there are estimated to be several dimes, a dozen cents, nickels and halves, a hundred quarters and a couple hundred Sacagawea test pieces. 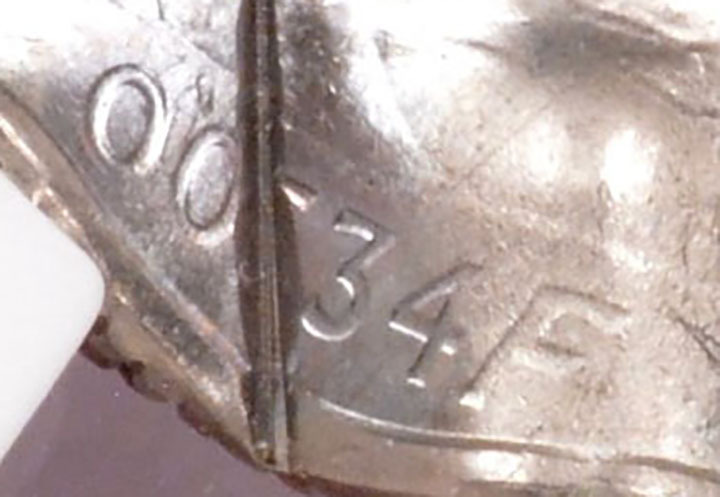 Here is the identification number on the obverse. Here is the identification number on the reverse. The U.S. Mint conducted metallurgical tests in 1999 on the golden colored manganese-clad planchets which would later be used for the Sacagawea Dollar. Click here for more info on the Brass Dollar Planchet from uspatterns.com. For the first time, the U.S. Mint included representatives from Industry because the new Sacagawea Dollar would have to be completely interchangeable with the existing SBA Dollar. The electromagnetic fingerprint had to be identical. All of the metals combined changed the alloy's electromagnetic properties. Many tests were conducted including those at IDX Inc., Olin Brass and PMX Industries. In a Coin World article on July 16th, 2001, James Halsey, President of IDX Inc. was interviewed. IDX Inc. is one of the firms contracted by the U.S. Mint to test prototypes. Mr. Halsey said "numerous samples in different alloys bearing the Martha Washington obverse and Mt. 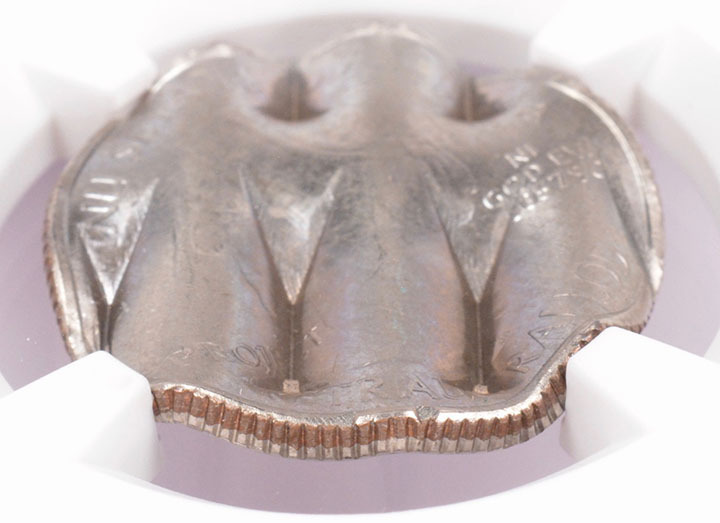 Vernon reverse dies - special designs used for experimental coinage - were shipped to IDX Inc. for testing. Some of the packages were insured for as high as $250,000, with the recipients required to return any and all pieces supplied by the Mint for tests." Two other firms under contract by the U.S. Mint include Olin Brass and PMX Industries. Both of these companies supply the U.S. Mint with the manganese-clad strips from which the Sacagawea Dollars are struck. Olin Brass is a leading U.S. copper alloy producer and is located in East Alton, Illinois. PMX Industries is located in Cedar Rapids, Iowa. 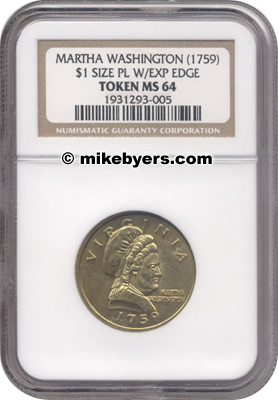 According to a Coin World article in the June 24, 2002 issue, "anti-tarnish tests were conducted at the Philadelphia Mint on January 8, 2000, on Sacagawea dollar blanks struck with the experimental Martha Washington obverse, Mount Vernon reverse experimental dies, according to Mint e-mails." 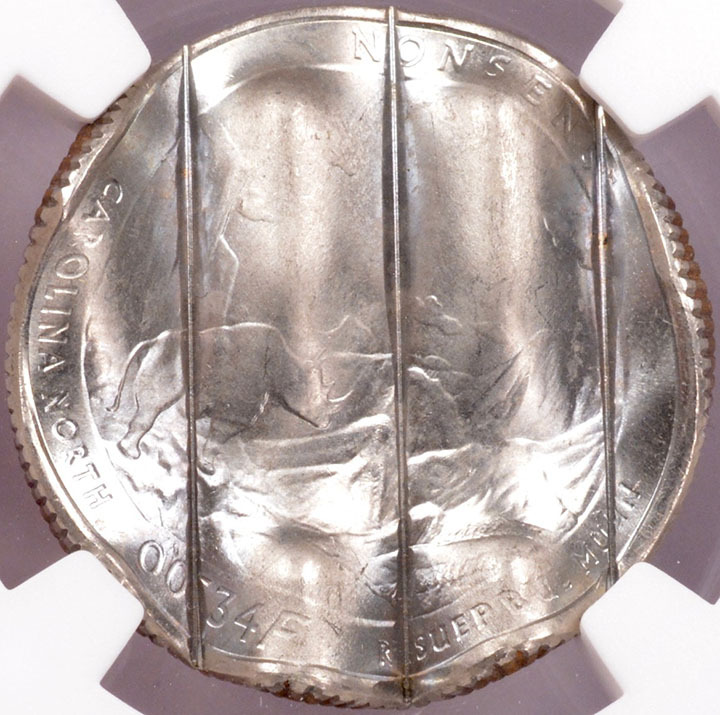 The article continued: "Seven processes were explored: one on circulation quality strikes, three on Uncirculated [Mint set] quality coins, and three on Proof quality strikes. The coins were struck on at least four different kinds of presses, with the blanks subjected to one of five burnishing methods." I discovered one of the three known Martha Washington Test Pieces struck on a Sacagawea Dollar blank planchet. 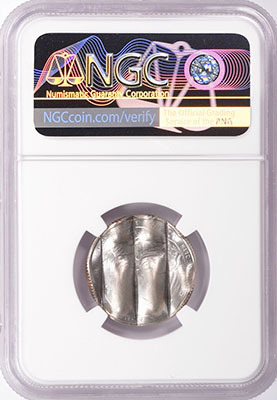 It was certified by NGC as a dollar-sized test piece weighing 8.0 grams and was graded MS 66. 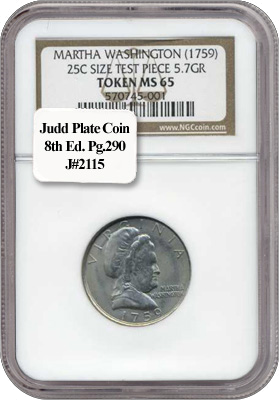 It is listed as Judd #2185 on page 294 of eighth edition of United States Pattern Coins, Experimental and Trial Pieces. A Martha Washington Half Dollar struck on a clad Quarter blank planchet sold for $29,900 in a Heritage Auction at the 2003 Mid-Winter ANA. Click here for more info on the Martha Washington Half Dollar from uspatterns.com. 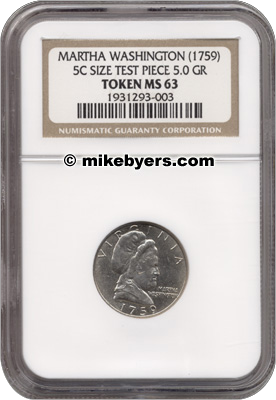 I discovered the first Martha Washington Test Piece struck on a clad Quarter blank planchet. 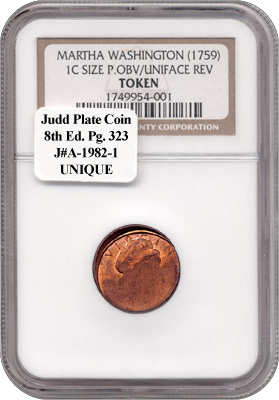 This coin is the plate coin for Judd #2115 on page 290 of the eighth edition of United States Pattern Coins, Experimental and Trial Pieces. Recently a second Martha Washington Quarter has been discovered. Click here for more info on the Martha Washington Quarter from uspatterns.com. The first Martha Washington Dime Trial Piece in private hands sold for $51,750 at the 2003 Baltimore ANA. 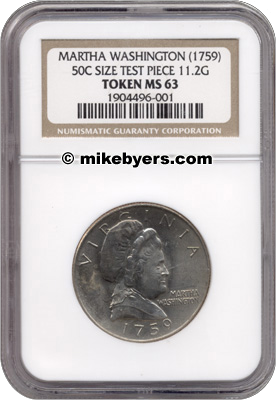 NGC authenticated and encapsulated this Martha Washington Dime in April of 2000. The second Martha Washington Dime Trial Piece is in the Heritage Galleries 2007 January Orlando, FL (FUN) Signature Coin Auction #422. 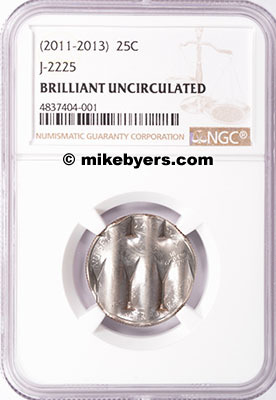 It was certified AU 58 by NGC and is struck in cupronickel-copper (multi-layer composite). Click here for more info on the Martha Washington Dime from uspatterns.com. 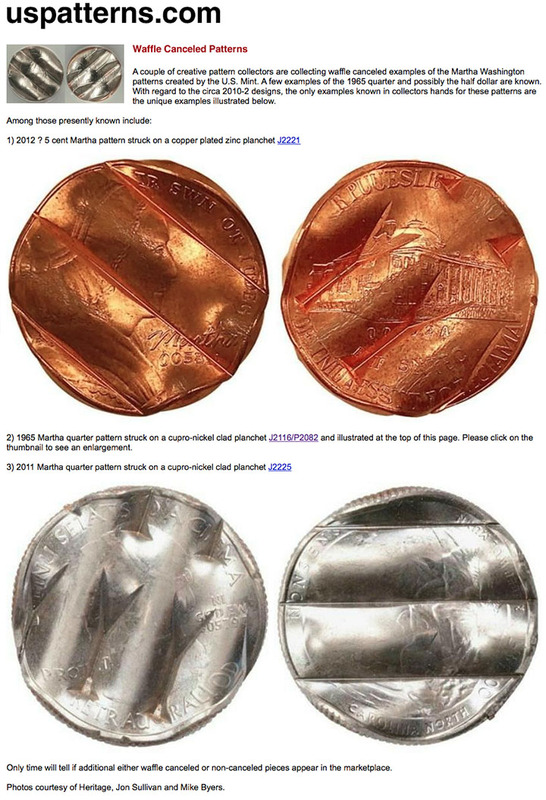 According to United States Pattern and Related Issues, by Andrew W. Pollock III, "the only trial pieces purported to have survived metallurgical testing in 1965 were the Dime, Quarter Dollar, and Half Dollar equivalent strikes in copper-nickel clad over copper." There is one set of a Dime, Quarter and Half struck by the Martha Washington dies that are permanently housed in the Smithsonian Institute, embedded in blocks of lucite. Click here to view the Martha Washington patterns permanently housed in a block of lucite at the Smithsonian. I also discovered a Martha Washington Test Piece struck on a copper-zinc Cent blank planchet. This Martha Washington Test Piece might have been used to test the new copper-zinc planchets for the U.S. Mint in 1982. 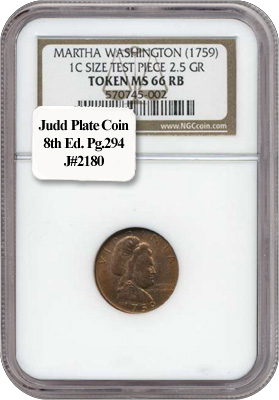 This coin is the plate coin for Judd #2180 on page 294 of the eighth edition of United States Pattern Coins, Experimental and Trial Pieces. Starting in 1982 the composition and weight of the Cent planchet changed. Instead of weighing 3.11 grams and having a composition of 95% copper and 5% zinc, the weight is 2.5 grams with a composition of 97.5% zinc and 2.5% copper. Click here for more info on the Martha Washington Cent from uspatterns.com. 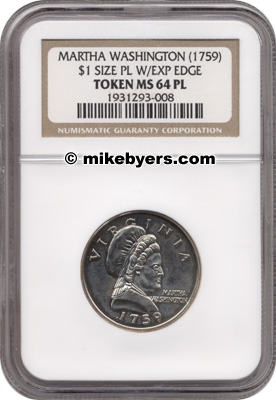 In August of 2000, I discovered a Martha Washington Test Piece on a copper-zinc Cent planchet that was struck 10% off-center with a uniface reverse. This discovery was a front page Coin World article on August 7th, 2000. 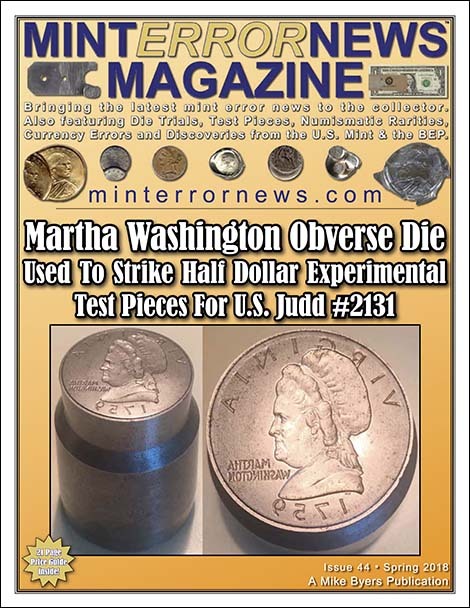 In a response to the Martha Washington Test Piece that I discovered, the Mint announced that "the dies are available to the Mint's metal and blank vendors for testing." This die trial piece was discovered by a Brinks employee. It is in gem mint state condition with red and brown toning. The obverse design of the die features a bust of Martha Washington facing right. In the right field is the inscription MARTHA WASHINGTON. Above the portrait is VIRGINIA and below the date 1759. The evolving story about the Martha Washington Dies, test strikes and the discovery of these pieces is among the most interesting Numismatic stories in decades. There is only one other known Martha Washington Die in private hands. It was used to strike the cent reverse for the experimental patterns and is also not cancelled. 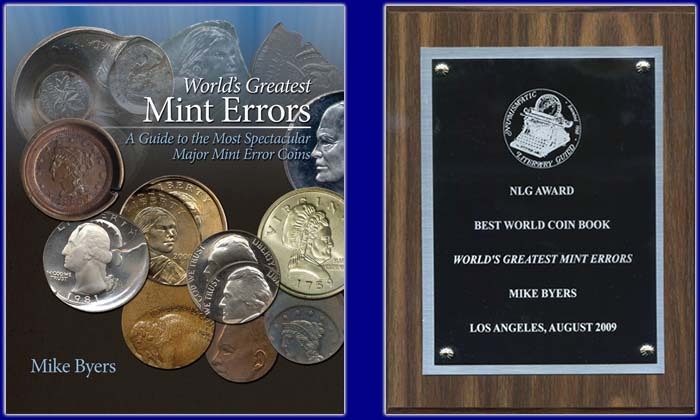 It was displayed at Fred Weinberg's table at the 2017 ANA coin show in Denver, CO and at the 2018 ANA coin show in Pittsburg, PA. He also had it on display at several Long Beach Expos in Long Beach, CA. His Martha Washington Die generated a tremendous amount of interest and excitement. 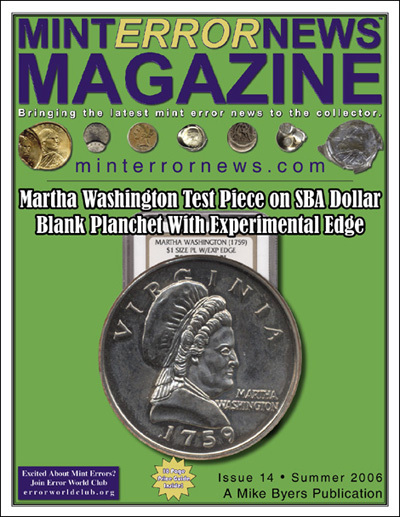 This half dollar obverse Martha Washington Die was featured on the cover of Mint Error News Magazine Issue 44 (Spring 2018). Below is the full story on the Martha Washington Test Pieces including my discovery in 2000 of the first (9) test pieces in different compositions and surfaces. 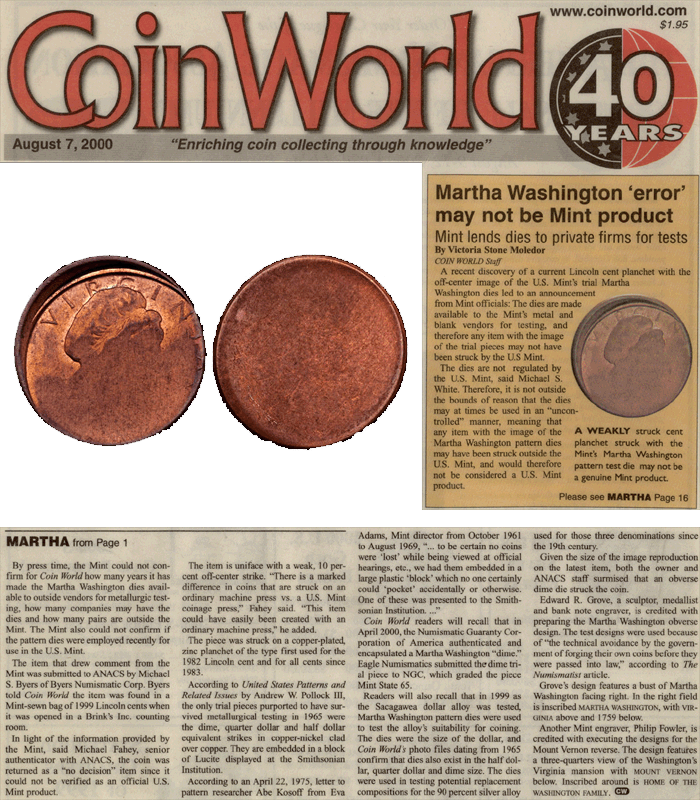 Coin World featured my first Martha Washington Discovery test piece in a front page article in their August 7, 2000 Issue. This is the only known Martha Washington Obverse Die in private hands for ANY denomination. The only other Die known in private hands is the Cent Reverse Die previously mentioned. This Die belongs in a collection of U.S. patterns or unique U.S. numismatic treasures. It is part of the ongoing U.S. Mint's history of experimenting and striking pattern coins prior to producing our nation's coins for circulation. This only known Martha Washington Half Dollar Obverse Die in private hands is featured in the U.S. 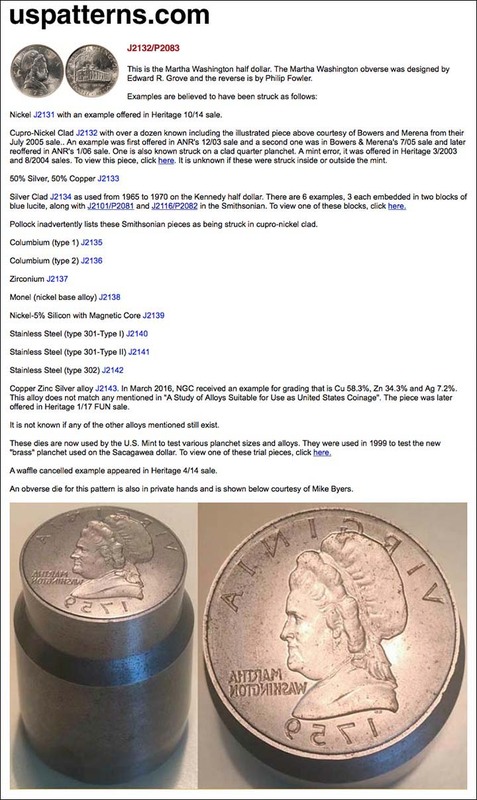 Patterns website (uspatterns.com) that references all U.S. patterns and related numismatic rarities. Click here for more information.